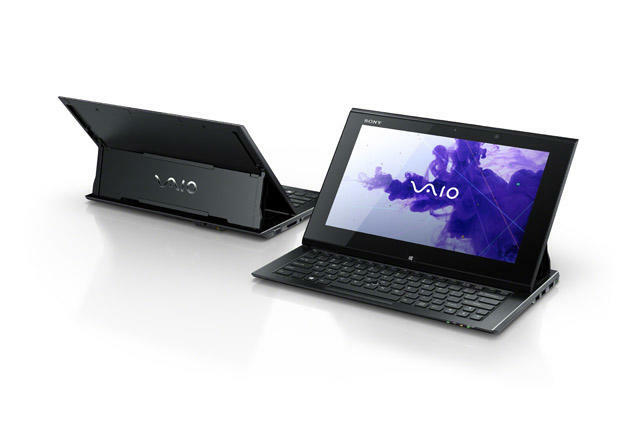 Sony has taken the wraps off of the VAIO Duo 11, a Windows 8-powered tablet hybrid, at IFA 2012. Windows 8 tablets are about to be showing up everywhere, especially ones that will have keyboards along for the haul. The Sony VAIO Duo 11 hasn’t had a price or launch date announced yet, but its looking like a pretty good addition to the VAIO line up. Options will allow you to trick out this tablet hybrid with 4 or 8GB of RAM, a 128 or 256GB SSD and several processor options from the Intel Core line. The 11.6-inch screen will offer full HD at 1920×1080 and allow you to take advantage of the touchscreen capabilities baked into the latest iteration of the Windows family. Expect this to launch in the fall with all of the other Windows 8 devices coming our way. Boost your productivity and creativity with VAIOTM Duo 11, the PC from Sony that also turns into a smart, intuitive touchscreen tablet. With its premium Surf Slider™ design, the powerful VAIOTM Duo 11 PC switches smoothly between keyboard and tablet modes to give the best computing experience – wherever you are and whatever you’re doing. Pick up VAIOTM Duo 11 in one hand and use in tablet mode to browse the web or enjoy music and videos while you’re travelling. In the office, slide out the keyboard and maximise your productivity with a fully-featured PC powered by latest-generation Intel® Core™ processors. VAIOTM Duo 11 puts touch and handwriting right at the heart of your Windows 8 computing experience. Write, sketch and interact with media and applications on the responsive, touch capable, super-bright Full HD OptiContrast™ Panel. A unique pressure-sensitive digitizer stylus gives the satisfying, expressive feel of handwriting directly on the touchscreen. Make notes, sketch diagrams or ring key points on your presentation with supple responses and imperceptible latency. Smart text recognition even lets you quickly convert handwritten notes to text for easy archiving and searches. A choice of swappable pen tips lets you select between a firm or softer writing feel. With selected apps VAIOTM Duo 11 even recognises when you’re writing, cleverly ignoring the pressure of your palm on the touchscreen. Sharing photos and videos is a pleasure on the super-bright 29.4cm (11.6”) Full HD OptiContrast™ Panel*. Friends and family will enjoy detail-packed, high contrast pictures with a wide viewing angle – even if you’re outdoors in bright daylight. Don’t let your PC slow things down when you’re in a hurry. Quick Boot gets you up and running in seconds. When you need a break, VAIO powers down into a deep energy-saving Sleep mode, keeping your documents safe. With RapidWake + Eco, everything’s ready for instant wake-up, just as you left off. Optional Sheet-type battery extends battery life, and also incorporates a handy digitizer stylus holder. Despite its slim size, VAIOTM Duo 11 is ready for business with a full complement of ports and interfaces including Bluetooth® Smart Ready, USB 3.0, HDMI, Ethernet and VGA video ports. You don’t need extra dongles or adapters to hook up a projector or secondary screen: everything’s on board. There’s a generous choice of apps to make the most of the unique touch experience offered by VAIOTM Duo 11. Active Clip™ makes it easy to crop photos and graphics with no special image editing skills. Just draw roughly around the edge of your chosen picture with the digitizer stylus. Active Clip™ uses technology developed by Sony that automatically detects edges and cuts out the background. Then drop the cleanly-bordered image straight into documents or presentations. ‘Note Anytime for VAIO’ lets you make handwritten notes any time… just like using a real notebook. (NB: this application will be available by download after VAIOTM Duo 11 on-sale date). There’s also an add-in for PowerPoint that brings extra impact and interaction to your presentations. Use the digitizer stylus to highlight points as you talk and capture audience feedback. VAIOTM Duo 11 also provides rich networked entertainment experiences. Through Sony’s One-touch* function, you can easily and instantaneously enjoy music and photos across an array of NFC (Near Field Communication) enabled Sony devices. Simply touch one device against another, and instantly establishing a wireless connection without the need for any Bluetooth or Wi-Fi set up. For example, it’s easy to continue listening to music stored on your VAIO through Bluetooth® headphones or speakers with One-touch function. * One-touch by Sony incorporates Near Field Communication (NFC) technology. You can also enjoy full access to millions of songs and themed radio channels at any time via Sony Entertainment Network’s Music Unlimited service (in selected countries). Expand your entertainment experience even further with three new apps by Sony that are available for free download. The ‘Music’ application lets you enjoy your music collection with superb quality thanks to xLoud and ClearPhase. The ‘Album’ application makes viewing, sorting or sharing pictures and videos fun and intuitive. Both applications let you ‘throw’ or stream personal photos, video and music content to enjoy on DLNA compatible large screen TV and audio systems. ‘Socialife’ is a unique application that organizes your social and information world. View, sort and manage all your SNS and news feeds through one stylish user interface, alongside your friends’ feeds and posts. Mark interesting articles for later reading when you’re not so busy. Based on what your friends are reading, Socialife also points you to other popular topics and even suggests content that you might like. Optional accessories include a screen protection cover and carrying case that protects VAIOTM Duo 11 while you’re travelling.